HDV tape transfer to computer. Video Image Productions provide an HDV tape transfer to computer video files. HDV is a format for recording of high-definition video on Mini DV cassette tape. The video was recorded in MPEG 2 format. It used the same Mini DV video tape format that was used for Standard definition video recording. 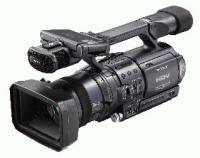 The format was originally developed by JVC and supported by Sony, Canon, and Sharp. The four companies formed the HDV consortium in September 2003. The data rate for both the audio and video is constant and is roughly the same as DV data rate. The relatively low video data rate can cause bit rate starvation in scenes that have lots of fine detail. Rapid movement or other complex activity like flashing lights. It may result in visible artifacts. These Include blockiness and blurring. In contrast to the video, HDV audio bitrate is relatively generous. At the coded bitrate of 384 kbit/s, MPEG-1 Layer 2 audio is regarded as perceptually lossless. I bought into HDV very early on. I still own a Sony Z1 which has been my work horse for many years. One important thing to remember with any HDV tape transfer to computer is to keep the tape heads clean. Our HDV tape to computer service is a totally digital process. Connections. Even though HDV is a tape based format it is still digital. Our HDV decks have firewire and HDMI output connections. These are then connected to our Apple and PC work stations. With this type of connection there is no quality loss in the transfer. The hardware used is Black Magic Design professional broadcast products. Link to Sony HDV tape.